In Kurma Dasa’s newest cookbook Quick Vegetarian Dishes, there is a delightful recipe for a Spinach & Cheese Tart which is equally delightful served at room temperature as it is served hot. Buying premade puff pastry dough makes for short preparation time but be sure you read the ingredients thoroughly to ensure that you do not purchase anything nasty. 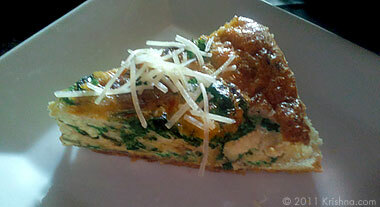 This delectable thyme-scented tart is filled with spinach and three types of cheese: ricotta, feta and Swiss. Using a good quality, ready-made puff pastry ensures trouble-free, quick preparation time. This tart is also excellent served cold for picnics. 2. Combine the ricotta, feta, breadcrumbs, spinach leaves, thyme, salt, pepper and nutmeg in a bowl. Mix well. 3. Line the base and sides of an 8 inch (20 cm) tart tin with the puff pastry and prick the base with a fork. 4. Spoon the mixture into the pastry case, spreading the mixture evenly over the base. 5. Sprinkle with the grated Swiss cheese and cover with a single layer of tomato slices. Sprinkle the tomato with the sugar. 6. Bake in the preheated oven for about 25 minutes, or until the cheese is browned and bubbling and the pastry is golden. For the tart in the picture, the tomatoes were obviously omitted because they were mysteriously eaten before I set out to make supper. However, I highly suggest adding them as directed in the recipe. As mentioned above, this tart is super scrumptious either hot or room temperature and is even more delicious eaten outside after a refreshing swim.